This is one of my all time favorite photographs. 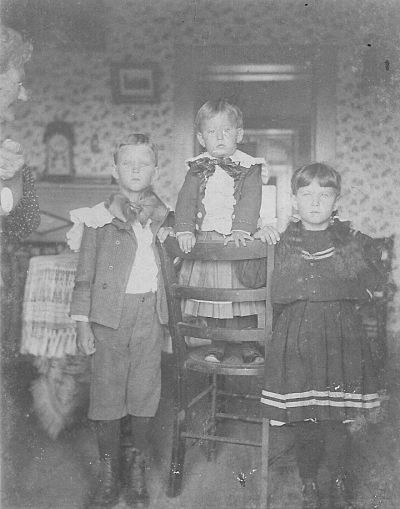 On the left side of the picture Adalbertha Bergmann Adam is gazing adoringly at her grandchildren, Willie, Eugene (standing on the chair), and Hildegarde. Eugene was born in June of 1898 so I’m estimating the picture was taken in 1900. They are the children of Julius and Ida Haufler Adam. We even get a peek into one of the rooms in the house that Adalbertha and Conrad built. It’s a fabulous picture for a sentimental Sunday! Adam Kids. Photograph of the original held by Jimmie Adam. Digital copy privately held by Kathryn Adam-Hurst. Boerne.